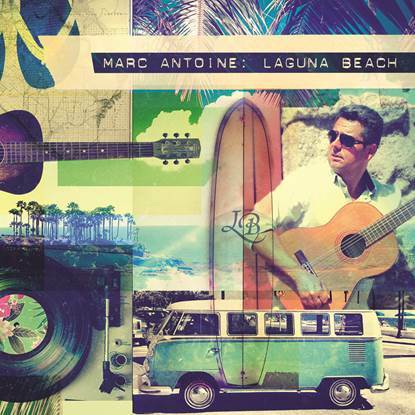 Marc Antoine | Laguna Beach - TheUrbanMusicScene.com | Music Reviews! Since he started making a dent in the contemporary jazz market as the R&R elected Best New Artist of The Year, Marc Antoine’s special brand of Spanish-injected stylistic melodies accented by his classical training and pop music background provided an incredibly unique voice and an international impact. After he was first introduced in the mid-nineties playing in pop sensation Basia’s backing band and contributing to the U.K.’s acid jazz scene, Antoine’s pure acoustic and nylon string guitar sweetness produced hits such as “Sunland,” “Unity,” “Latin Quarter,” “Cruisin’”, plus the remake of Sergio Mendes & Brazil 66’s “Mas Qe Nada.” Though Antoine was a fixture in the mainstream contemporary jazz scene, he was always willing to explore other territory such electronic dance music, Celtic and African music and his classical roots (through his CD’s Universal Language, Modern Times and My Classical Way respectively). During his tenure as a session player, Antoine spent considerable time in Los Angeles, which he clearly treasures in his musical heart. Thankfully, Laguna Beach picks up incredible speed with some Latin kick. The tango takes center stage on “Romantico,” where Antoine’s acoustic guitar seamlessly flows amongst the rhythmic intricacies and fierce percussive choruses. Despite the pop feel of “High Five,” Antoine lets loose with his impeccable Spanish guitar flair. Then there are the bossa nova tracks, which are two of Laguna Beach’s absolute highlights. Interplay can never be overlooked in a jazz setting, such as the magnetizing connection between Antoine, Saisse and Tim Welvaars’ harmonica for Deixa. “New Morning” thrives on Saisse’s lively electric piano solo leading into a clever percussion break. Though the ride throughout Laguna Beach provides quite the relaxing soundtrack, it seems a few tracks are rushed to a certain point lacking a decent space in time for memorable improvisations. Yet when the musical connections and passion take center stage, especially with the urban and Latin tinged moments, that is where Antoine proves his musicality that brought him to prominence in contemporary jazz. Three and three-quarter out of five stars.